STUDIOone consists of a simplified Video Recording Studio and a complete Video Editing Suite. STUDIOone is available to all University of Mississippi affiliates. Read on to find out more about the different areas in STUDIOone. 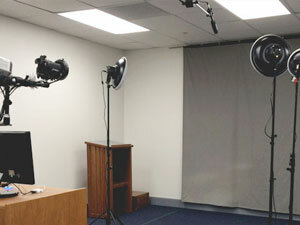 Based on the Penn State One Button Studio model, the Video Recording studio is a simplified video recording setup that can be used without any previous video production experience. The design of the studio allows you to create high-quality and polished video projects without having to know anything about lights and cameras. You only need to bring your flash drive with you and push a single button. When you have finished recording your video, simply remove your flash drive and all the equipment will shut down and turn off automatically. 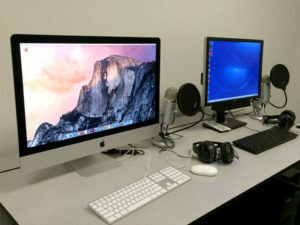 The Video recording studio is equipped with a projector which is connected to an iMac so you may display slides or any other type of visual presentation you want to include in your video. The room also has a podium and several chairs for a small audience. The Video Editing Suite contains the necessary hardware and software needed to produce quality video projects. The software ranges from simple quick edit tools to complete eLearning packages which can incorporate a variety of media and quizzes. The Video Editing Suite contains one Dell PC running Windows 10 and one 27-inch iMac running OSX Yosemite, so you can choose the operating system and platforms you are most comfortable with. Each computer is supplied with a professional headphone and microphone set.